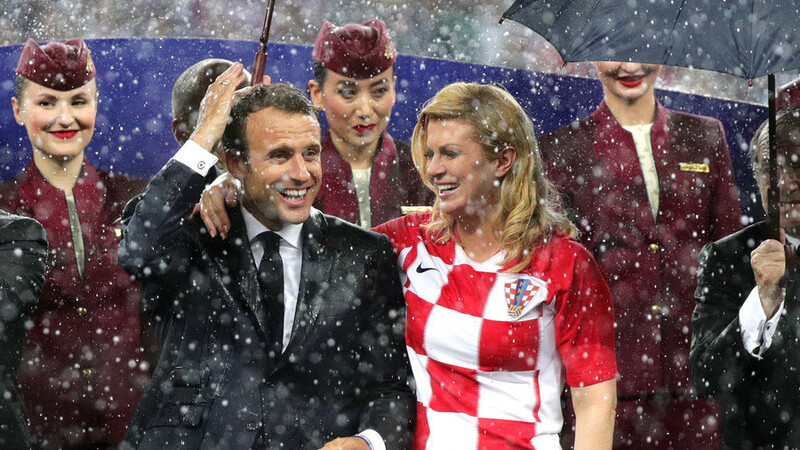 Croatian President Grabar-Kitarovic says she was so caught up in the emotions of the players and fans after the nation’s World Cup final defeat in Moscow that she didn’t even notice the massive downpour that left her drenched. The Croatian leader was among the high-profile officials attending the World Cup final at Luzhniki Stadium earlier in July when France beat Croatia 4-2. Grabar-Kitarovic stepped onto the pitch after the final whistle to hand out awards to the players, taking the time to console the Croatian players after their defeat in what was a first-ever appearance in a World Cup final for the small Balkan nation. 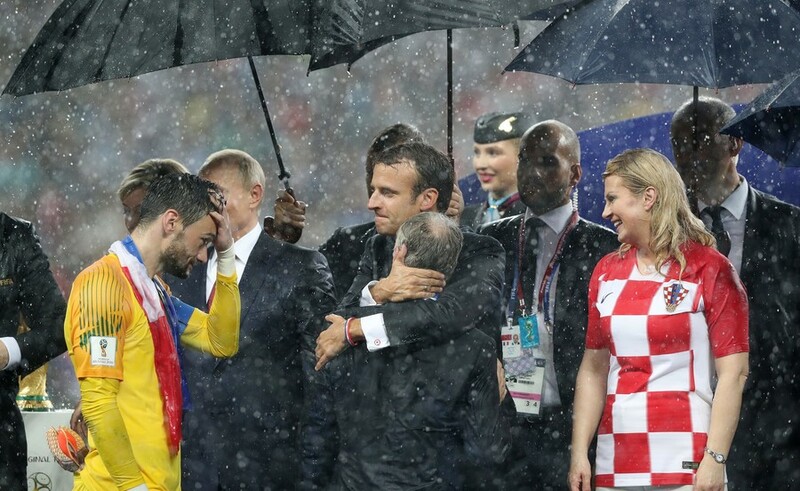 When Grabar-Kitarovic, along with French counterpart Emmanuel Macron and Russian leader Vladimir Putin, climbed onto the podium a huge rainstorm broke out, drenching the players and high-profile guests despite the presence of umbrellas. 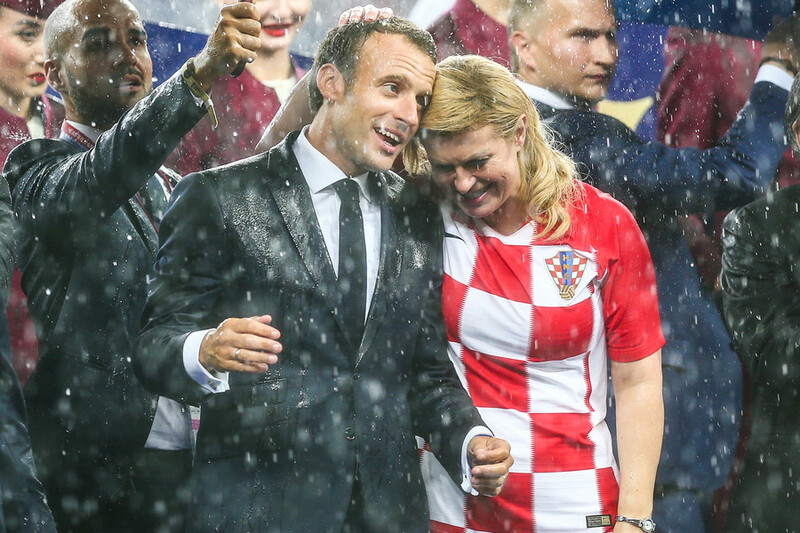 Soaked to the skin, Grabar-Kitarovic stoically continued to congratulate and console the players while dressed in the red and white checkered Croatian national team jersey, which became her trademark attire during the tournament. The Croatian leader said she had been so caught up in emotion that the apocalyptic downpour hadn’t bothered her at all. “I didn’t even notice the downpour until it stopped raining,” Grabar-Kitarovic was quoted as saying by Kommersant. “My hairstyle and the way I looked like at that moment didn’t bother me at all because all my thoughts were about the players and those who supported us in Croatia and all over the world,” she added. “I didn’t care about an umbrella, as on the one hand I was inspired [by the team’s performance], but on the other hand I was worried about the players who were upset by their defeat in the World Cup final. Especially when I saw [team captain] Luka Modric approaching me with the best player award,” she added. The first Croatian female president won hearts during the World Cup for her passionate support for the team throughout the tournament. She was spotted mixing with fans in economy class on flights to Russia, and was a frequent presence in the stands during the team’s historic run to the final. She also presented a personalized Croatian football jersey to President Putin during their meeting in the Kremlin, being given flowers in return by the Russian leader.